"Material Choices for Mars", and found a lot of references. I will mention these. ETFE has optimum properties for use as a greenhouse on Mars. ETFE is an excellent thermal insulator, and thus, as the greenhouse effect occurs, the need for an additional heat system during the day will be reduced. Dust does not settle on ETFE so the transmittance of light into the greenhouse will not be affected during dust storms, and ETFE has excellent wear resistance so it will not be damaged by the external environment. Furthermore, ETFE has approximately 95% light transmittance which allows a wide range of wavelengths to pass through the material, however, ETFE can be fritted (patterned) to allow less solar transmittance. Because Mars has high intensity infrared (IR) waves, ETFE in the ELSM Greenhouse will be fritted to minimize the transmission of IR waves so the plants are not damaged by these waves. The permeability properties of ETFE create an optimum environment for a greenhouse on Mars with a controlled gas exchange system. ETFE has a high permeability to carbon dioxide (CO2), which will allow for the transport of CO2 from the Martian atmosphere into the greenhouse for use by the plants. Furthermore, ETFE has a low permeability to both oxygen and water vapor, which will prevent loss of oxygen and water vapor from the greenhouse to the Martian atmosphere. There are several different fluoropolymers, that is polyer that includes fluorine. Most people are familiar with PolyTetraFluoroEthylene (PTFE), sold by Dupont under the brand name Teflon. Gore Textile company sells a fabric woven of fibres made with that same polymer, sold under the brand name Goretex. Apollo spacesuits had an outer layer of woven fibreglass coated in Teflon. The EMU is the white spacesuit used on the Space Shuttle and ISS, it has an outer layer that isn't just coated in PTFE, it *IS* PTFE. The outer layer is actually a double layer fabric; the facing layer is Goretex, the backing is Nomex with 2 threads replaced by Kevlar every 3/8", in both the warp and weave directions. Nomex is the fabric used for fire fighter jacket and pants; it's fireproof. Kevlar is used for bullet proof vests, so adds strength. This combination fabric is known as Orthofabric. Gore Textile company also sells clothing for outdoor use on Earth, also sold as Goretex, which has more traditional fabric, but sandwiched between two layers of fabric is a polymer film. That film is PTFE, so that's what makes it "Goretex". The film has tiny holes, and PTFE is hydrophobic, which means it repels water. Surface tension prevents water from getting through the holes, but water vapour can. That makes clothing water repellent and lets it breathe at the same time. Obviously if you step in a puddle, humidity from your feet is not going to get out while your boots are in the puddle. So your boots will accumulate sweat. But once your boots are dry, sweat vapour can pass out through those holes. This is not what a spacesuit uses. A spacesuit uses heavy fabric composed of threads that are PTFE. And basic terminology: a material composed of long chain molecules is a polymer. Most people call this plastic. Technically, if the material melts when hot, or at least deforms like plasticine, it's thermoplastic. There is another class of polymer that just gets harder when you heat it; that's called thermosetting. So all plastics are polymer, but not all polymers are plastic. The polymer I talked about is not the one you name. ETFE is EthyleneTetraFluoroEthylene, notice the word "ethylene" appears twice. Technically TFE (TetraFluoroEthylene) is a monomer, meaning a single molecule of a simple chemical that can be linked together, but as a monomer it isn't connected yet. PETFE is a polymer, which is a co-polymer of Ethylene and TFE. That is E and TFE alternate: one, then the other, then the first, then the second, etc. I noticed many websites use the acronym ETFE to refer to PETFE, although technically you should add the 'P' to mean polymer. ETFE (or PETFE) is sold under the brand name Tefzel. It's more expensive than polyethylene (PE), or polypropylene (PP), but much stronger and much more durable vs UV. And able to handle extreme temperatures. This is the premier material used for greenhouses on Earth. However, not really good enough for Mars. Dr. Penelope Boston told me it can't withstand the UV in Utah, much less Mars. And documentation I found says most Tefzel film available will become brittle at -80°C, the best will become brittle at -100°C. Mars at night gets down to -80°C practically every night. Temperatures measured by Mars Pathfinder went down to -77°C during the 3 days it took measurements. Remember the day when the media claimed Winnipeg is colder than Mars. That was a short, one-sentence status update by the manager of the local planetarium and science centre. The media jumped on it. What they didn't tell you is the overnight low in Winnipeg was colder than the daytime high measured by Curiosity on Mars. The overnight low on Mars that day was -104°C. Earth never gets that cold, anywhere, not even Antarctica. And notice that low is below the embrittlement temperature for the best quality Tefzel. You don't want the polymer film cracking by the slightest puff of Mars wind, or air puff from closing a door inside the greenhouse. A crack in the film will release atmosphere, decompressing the greenhouse. The one I gushed about is PolyChloroTriFluroEthylene (PCTFE). It's a simple polymer, made from one monomer. It's chemical formula is -CClF3-. It has one fluorine replaced with an atom of chlorine. This one is more durable vs UV, because it's so transparent to UV. And it's stronger than pure PTFE or PETFE. It was sold by 3M under then name Kel-F, but they stopped making it in 1995. Today it's made by a Japanese company called Daikin under the brand name Neoflon; but they use that name for all their fluoropolymers, so you have to order it as Neoflon PCTFE. It's also made by the American company Honeywell, which uses two brand names: Aclar for water proof film for blister packs for pills (pharmaceuticals), and Clarus for the military and aerospace industries. PCTFE is extremely impermeable to moisture and oxygen. There are other polymers more impermeable to oxygen, but they become brittle at temperatures between -6°C and -60°C. They would never survive a night on Mars. But PCTFE is the most impermeable to water of any polymer know to man. Period. That's why it's used to keep pills dry. And if you metallize the film, such as aluminized Mylar, the metal clogs pours in the polymer film making it even more impermeable. Of course you wouldn't use Mylar, it becomes brittle at -60°C. And you wouldn't use aluminum. The spectrally selective coating that NASA uses to keep out UV and control IR is silver oxide, nickel, and gold. Only silver is oxidized. So the metal coating to control UV & IR will help make the film impermeable to air. That ensures air doesn't leak out. Light transmission at various frequencies, for various materials. My greenhouse webpage has a table with gas permeability for O2, N2, CO2, and water for 1 mil film with no coating and at +25°C. We would probably want 2 mil thick film for Mars. But this table shows you how impermeable PCTFE is. Basically, gasses just don't get out. Light transmission for various spectrally selective coatings. These are commercially available on Earth, not the one NASA uses. And these are coatings on 1/8" glass. Line #1 is glass with no coating, clear glass. Line #5 is "low-e", a brand name for silver oxide. This is commercialization of NASA's technology. They don't use nickel or gold for cost, and because you don't need UV protection that strong on Earth. Notice "low-e" still has very good UV protection. One key factor is reflection of short wavelength IR vs long wavelength. Short wavelength comes from something very hot, such as the surface of the Sun. Long wavelength comes from something warm, such as the floor or furniture. Notice low-e blocks much more short wavelength IR, and less long. That blocks radiant heat from the sun, but lets radiant heat from the floor and furniture get out. It reflects some of all wavelengths, but lets out more than it lets in, causing a net cooling effect. This is marketed to office buildings in the southern US. The wavelength pattern is different for coatings sold to northern states and Canada, were we're concerned with heating in winter. Different application, different coating. Thanks for your corrections. My misdirection into ETFE may yield results for other purposes, later, but I can see that at the very least the outer barriers which must endure the cold of night and Mars level U.V. will have to be better than ETFE. At least I am not lost in a snowstorm without winter cloths anyway now, so thanks again. As you know I have two fantasies that I am currently babbling about. Neither on of them requires U.V. to penetrate through the plastic, but if it could as desired, that would be better. ETFE is supposed to have that quality. That is why I went for it. I should get a job as a professor. The University of North Dakota in Grand Forks has a degree in space studies: B.S. minor, or M.S. major. I wonder if they're hiring? This link, suggests that ETFE would work on Mars. I am not questioning your authority on this but have they misnamed something else as ETFE? Are they just lost in the woods as well? I may be out of touch for a while, getting ready for tomorrow. I had also thought ETFE would be appropriate for Mars. It was Dr. Penelope Boston who schooled me, told me it wouldn't withstand the UV in Utah. That's where the Mars Desert Research Station (MDRS) is located. Dr. Boston is one of the originals who started the Mars Underground; that inspired Dr. Zubrin to found the Mars Society. She's a research fellow at the Ames Research Center, NASA. I have been honoured to talk to many knowledgeable individuals at Mars Society conventions. I took that as a challenge, set out to find a material that is suitable. The next year I brought 8.5x11" samples of PCTFE, Tefzel, and FEP, and material characterization documentation. She was impressed. There are some people who claim temperature characteristics of ETFE are good enough for Mars. That heat inside the greenhouse will keep the film warm, so it won't get down to embrittlement temperature. But I'm worried about worst case scenarios. Especially if you walk inside that without a spacesuit. PCTFE (CTFE) is a more expensive, but UV durability and gas permeability is better. And if you're spending billions for a launch, I don't think you want to skimp on a few hundred dollars for the greenhouse. PCTFE becomes brittle at -240°C. That's 100°C colder than the coldest spot of the Mars south pole, in southern winter. According to temperature data from Mars Global Surveyor. The document you linked has gas permeability for various polyimide materials, not just fluoropolymers. And it has CO2 permeability for CTFE. Woo hoo! Really? How do they come to that conclusion? How many materials on Earth are supposed to not let dust settle? How many of those have you had to dust? Sounds like a TV ad with a yelling sales pitch. To quote a spoof that one of my computer science university professors put into an assignment: "You can tell we're K-Sell because we yell!" Furthermore, ETFE has approximately 95% light transmittance which allows a wide range of wavelengths to pass through the material, however, ETFE can be fritted (patterned) to allow less solar transmittance. Because Mars has high intensity infrared (IR) waves, ETFE in the ELSM Greenhouse will be fritted to minimize the transmission of IR waves so the plants are not damaged by these waves. Fritted glass is finely porous glass through which gas or liquid may pass. It is made by sintering together glass particles into a solid but porous body. This porous glass body can be called a frit. 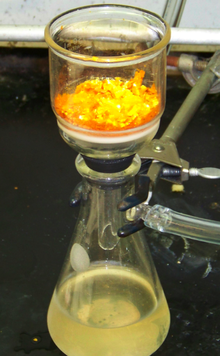 Applications in laboratory glassware include use in fritted glass filter items, scrubbers, or spargers. Other laboratory applications of fritted glass include packing in chromatography columns and resin beds for special chemical synthesis. They want to make the film deliberately permeable? What! This isn't a good idea. Mars has 95%+ CO2 atmosphere; exact amount changes with Mars weather, it was measured by Viking 2 as 95.32% @ 7.5 mbar. Earth's atmosphere was measured in 2014 as 0.043% CO2, and pressure at sea level is 1013.25 mbar. Using an air pressure altitude calculator, I get 83528.77 Pa = 835.2877 mbar. That means partial pressure CO2 at Boulder is 0.36 mbar. Partial pressure CO2 at the Viking 2 site was 7.149 mbar. Sounds like it should diffuse in, doesn't it? That's before you realize total pressure inside is much higher than total pressure outside. And a sintered/fritted material will not act as a semipermeable membrane. Gas permeability figures are completely different for a film vs fritted material. Expect their fritted ETFE to leak like a sieve. Fritted material is a sieve. From the Wikipedia web page for "Fritted glass". A Büchner funnel with a sintered glass disc. Note the glass disk is a sieve, with liquid flowing into the flask below, and solid material remaining above. I stand corrected. Halar, Kynar, Tedlar, and Dyneon are not polyimide, they're fluoropolymers. But Tedlar is opaque, and operating temperature range is -72 to 107°C (-98 to 225°F). Halar is a co-polymer of ethylene with CTFE; it has an operating temperature range of –76°C to +150°C (–105°F to +300°F). Kynar film operating temperature range is –30°C to 140°C (-22°F to 284°F). Dyneon is a brand name of 3M, they make a range of fluoropolymers under that name. One document says operating temperature range is -200°C to 260°C, but it doesn't say which that is. I believe that is for FEP. Your document with gas permeability mentions THV. It's an elastomer, meaning synthetic rubber. Technical (sales) brochure says it's only able to form a seal as low as -40°C, that's not the application we're talking about. Interesting, why wasn't it used for O-rings for Shuttle SRBs? They call it "3M™ Dyneon™ Low Temperature Fluoroelastomer" (LTFE), which is a sales description, it doesn't tell me what the chemical formula is. Another document says service temperature is -50°C to +200°C. That is rubber, not transparent film. Dyneon THV is a polymer of tetrafluoroethylene, hexafluoropropylene and vinylidene fluoride. This one is film. Ah, found it. Dyneon THV 500 service temperature is -50°C to +130°C. Relax buddy, you have the hard job. -Provide safety egress/rescue in the event of failure. -Block the permeation of gasses. I on the other hand ran away screaming from that, anticipating gross failure, and dead foaming bodies on the Martian ground after the balloon explodes. That is not to say that it cannot be done, but rather that I don't know how to do it. When I meet cannot do, I set it aside and see if there might be something I might do, until if ever I can approach the cannot do again. For now, I have two projects I am interested in. 1) Abiotic biochemical from sunlight, perhaps involving so called "Plastic films" (Although I can think of other methods of Abiotic that do not require plastic films. 2) Lake methods. I have vandalized this site with my manic nonsense about lakes for long enough for you to know what that is. Abiotic, I will set aside for now. Lakes, I rather hope to have your assistance on. So, as a sissy, I have comprehended that layering might offer shelter from the nasty reality that Mars is not Earth. I will briefly mention that GW has suggested regolith covered ice covered lakes, which is fine, if you are willing to provide methods for utility of the waters of the lake below the ice, such as artificial light or chemicals that might support life that will support human presence. I of course for the entertainment value have continued to try to find a way to deliver photons into such an ice covered lake, and to provide support for a human presence that way. Before I continue with my notions of such a lake, it is important that I will confess that for the scouts and very likely for the first settlements close to the equator of Mars, such lakes will be a luxury that cannot be supported. Therefore it will be abiotic and your methods that must offer the first direct solar driven biological processes that can support human life on Mars. Lake notions are for a later phase of human occupation of Mars. The lake method I currently most support for Mars involves a rather fresh water where a water turn over is not promoted, that is the water at the bottom is 39 degF, the water at the top is 32 degF, and above that is a protected ice layer. The ice layer is protected by so called "Plastic Films". It might help illustrate what I am after. At minimum I would have three "Plastic Films". 1) I want underwater pressure shells. They could also include fretting, which might filter out U.V. ETFE might work for this. * In this case selective permeability might suit my purposes, where CO2 will pass, and O2 and H20 will not. Not sure yet. 2) Above that I want some kind of "Plastic Film" coating ice pans of an artificial ice cover covering an artificial rather fresh water lake. Don't know if this could be ETFE. 3) Above the plastic coated ice layer, I want a air filled "Plastic Film" which will serve to isolate the atmosphere of Mars from the evaporation from between the cracks in the artificial ice pans of the ice layer. Such a vapor could then be collected. My best want is for UV to penetrate into the lake, and to be stopped by Item #1. Other options can be considered. Hope you can digest this O.K. Got some numbers problems. I do know what specsmanship is, and I understand that you are most likely standing on good ground from your perspective, but I am being given this contrary information from our beloved internet. I value your opinion. ETFE film is self-cleaning (due to its nonstick surface) and recyclable. It is prone to punctures by sharp edges and therefore mostly used for roofs. In sheet form as commonly employed for architecture, it is able to stretch to three times its length without loss of elasticity. Employing heat welding, tears can be repaired with a patch or multiple sheets assembled into larger panels. ETFE has an approximate tensile strength of 42 N/mm² (6100 psi), with a working temperature range of 89 K to 423 K (−185 °C to +150 °C or −300 °F to +300 °F). ETFE resins are resistant to ultraviolet light. An accelerated weathering test (comparable to 30 years’ exposure) produced almost no signs of film deterioration. Whoa! Someone made ETFE that can operate at -185°C, under stress, without embrittlement? Good for them. Of course there's still the issue of permeability and UV durability. As for it being a nonstick surface, you can say that about pretty much all fluoropolymers. Anyway, I started looking at this after studying Mars Direct in "The Case for Mars". Brilliant plan. And reports from the Case for Mars conferences of the 1990s. They included an inflatable greenhouse. I keep hearing excuses why a human mission to Mars won't work, and keep trying to debunk those arguments. Dr. Penelope Boston wrote one of the reports from an early conference, so I was shocked and disappointed when she said it couldn't be done. The issue was finding a material, so I worked on that. I still see burying a greenhouse as overly complicated and paranoid. You don't need to. Let's do some more calculations. I enjoy technical stuff. PCTFE has a bursting strength of 19.4psi, ETFE has 33psi. We will operate at much lower pressure. But engineers have pointed out tensile strength is the important statistic. A large pressurized enclosure accumulates a lot of force. Let's calculate that. A Mars Direct greenhouse, not a larger homestead. Say 6 metres wide, by 3 metres high, by 12 metres long. With hold-down straps to squash it into an ellipse, not a cylinder. Assuming the cross section down the middle is a perfect ellipse, across the waist will be 14.53263165 metres circumference, and along its length 25.7325089 metres circumference. Assume 2.7psi partial pressure O2, and 3.6psi partial pressure N2. As I've said before, assume 3.0psi pure oxygen for the spacesuit, and give the hab 10% less partial pressure O2 than the suit to allow for 10% pressure loss and still leave the astronaut with what he/she is used to in the suit. And make nitrogen the maximum for zero prebreathe decompression: ratio of partial pressure N2 in the hab to total suit pressure is 1.2, so that gives 3.6psi pp N2. Total is 6.3psi hab pressure. Assume the greenhouse has the same air as the hab, so the two can be connected. I did this with a calculator. So I re-did it in a spreadsheet, and got the same result. What did I do wrong? Should I calculate by the waist instead of length? I like the idea of a lake habitat. If the habitat is close to the surface of the lake, that will not interfere with use of the habitats for agriculture - perhaps with the aid of some solar reflectors to beam solar radiation on to the habitat roof. However, maintaining the lake surface level would be critical! The airlock could be through the adjacent ground. More generally, borosilicate glass seems a good materials choice for Mars - given its robust properties and the fact the constituent parts are to be found on Mars in abundance. It appears to be able to withstand a temperature difference of some 165 degrees celsius, so that should be OK for Mars at the right locations. However, you might need a double skin - so you have a habitat with earth like temperatures surrounded by a second space that is say 80 degrees celsius colder. Returning to the lake habitat - why not have an ice lake with a chamber built into the ice. Line it with an aerogel layer. Inuit light lamps in igloos. Would the ice stay unmelted if the heat escape was slow/low enough? I suppose though, you don't get your natural light that way. That said, I think we should never lose sight of the colonisation stage. For my money, it makes a lot more sense to build covered habitats at the initial colonisation stage, using Zubrin's suggested Roman brich arch method over trenches, and covering in regolith. You would then use artificial light internally for crop growing. Moving to the next stage, we might be able to install borosilicate panels or ice panels over trenches to provide natural light (using, again, solar reflectors to enhance light levels). The third stage would be building low pressure, high CO2 domes as our farm habs. A fourth stage might be creating eco-habitats by installing glass/plastic roofs over natural gorges and pressurising them, so that we have place where there is abundant growth of flora and fauna in a semi-natural ecosystem, with birds, mammals, reptiles and so on. These would provide a pleasing "playground" for the Mars colonists to relax in. With steep sides such gorges provide a lot of exercise area with relatively little over-panelling required. An ideal first gorge might be say 400 feet long, 50 feet deep and about 40 feet wide. The plastic sheeting would be heat-bonded together. If you had an area covering say 10,000 sq. ms. the 400 metre perimeter boundary would be weighed down with copious amounts of regolith (packed tightly at the perimeter but more loosely as you move away from the perimeter). This would allowed the slow evening out (gradation) of pressure (between interior and exterior), as the interior is slowly pressurised. I am not a techy but I think that might work! But you are back to finding a plastic that admits solar radiation but can withstand the rigours of Mars. Of course it would be energy intensive, in that you would have to continually compensate for lost "air" through air manufacture. But you would win out in terms of construction costs, and the ability to cover a large area quickly. In terms of heating the space, I would again suggest solar reflectors to build up heat during daylight hours. If such spaces were our farm habs, we might also think in terms of planting thermogenic plants (plants that release heat at night) among the food plants. If heat loss is a serious issue, then we might have to think in terms of a secondary sheeting - aluminium foil sheets that would be deployed underneath the plastic sheeting at night. This might be less complex than imagined. I can imagine robot vehicles performing this simple task (dragging the aluminum foil curtain across from A to B) using a robot arm. Might only take an hour or so for a team of say 10 robot vehicles to perform such a task. Interesting thread and some excellent research going on here. One other problem that I can see with plastic greehouses on Mars is static charge. Friction from air, dust particles and ionisation from UV would would build up a charge in such a dry, thin atmosphere. The result may be that Martian fines stick to the greenhouse and ruin its opacity. This would create a severe maintenance problem. Part of the solution may be to cover the domes with a thin mesh that is grounded and disperses the charge. Washing the domes would be difficult as water would evapourate and freeze very rapidly in the thin atmosphere. Maybe compressed gas jets could be used to dislodge the particles? That doesn't sound like a lot. 19.4psi is only 132KPa. Even polyethylene has a yield strength of 15MPa. Polycarbonate is 70MPa, depending upon who's figures you believe. Circumference = 12x2 + 6x2 = 36m. Always work in SI units for scientific calculations. Never use imperial, it just isn't professional. I say that as an Englishman whose ancestors invented imperial. Thanks for the improvement for my understanding RobertDyck and Antius. It just happens that I am interested in three items at this time. 2) Abiotic synthesis of biochemical. 3) Plastic greenhouses receivers which use heliostats to increase the amount of lumens received. Even in this case, I anticipate using a underground cistern/lake as a escape route in the event of a receiver puncture. All of these three will be related to the works mentioned in this topic, but #3, the Receiver will most likely just be a rip off of the work others have done, such as RobertDyck. -The outermost layer must endure the greatest temperature cycling. -The middle layer of plastic will encapsulate ice pans, and perhaps have a more moderated temperature cycle. -The greenhouses/diving bells will have a rather constant temperature. So, I can mix plastics, perhaps the outer layer being PCTFE, the greenhouses for temperature purposes can be ETFE, and the ice pan encapsulation may be one or the other or perhaps something else. I think fretting can safely be used either on the outer layer (If you can fret PCTFE), or on the greenhouses, to protect from U.V. spectrum which is counterproductive. My reasons are, that for the outer layer, you don't care that much about permeability. The differential pressure is slight at most. Further the literature about fretting on ETFE indicates that the plastic still blocks water vapor, which would be a major function of the outer layer. As for the greenhouses in the lake water, I anticipate that it will be rather practical to control what gasses are dissolved in the water, therefore permeability will be less of a concern. My preference is to allow the U.V. in and to absorb it somewhere in the lake water and convert it to other spectrum, such as infrared or perhaps even to fluoresce it to visible. (That will be something to work on). Should the rate (Over a period of time) of deterioration of the PCTFE or ETFE be too costly, then I will opt for blocking the U.V. from entering the lake at all, block it at the outer layer. If using that conservative method, we still have the PCTFE deteriorating, then I would intend to replace it periodically, like the epidermis of the skin. The only thing that would stifle that would be cost. That will be unknown until later. As for permeable webs, I actually think their might be opportunity to bend that to our use. No specific examples yet, but I think so. Anti-static coatings are simular to those that prevent plastics breakdown and are even simular in element make up such as Indium tin oxide which is a transparent antistatic coating of windows. Remember the plastic will be coated with NASA's spectrally selective coating. That's nickel, silver oxide, and gold. Only silver is oxidized. Don't you think gold is a good enough antistatic coating? You're right, there are 3 dimensions. I calculated the ellipse around the waist, and over the top the long way. You did it around the sides. You assumed a rectangle, but close enough. That still doesn't account for why tensile strength calls for such an extreme thickness. Ok, SI units. We could drop total pressure. Skylab used 3.0psi O2 + 2.0psi N2 = 5.0psi total. But let's just change to SI units first. Technical specifications for PCTFE from Japanese manufacturer Daikin, given for film 50µm thick. Using the smallest circumference, over the top around the waist, and the weaker direction for film, and zero safety margin, I calculate this requires film 12.75259591mm thick. If we use Skylab pressure, it's 10.12110786mm thick. This is insane! At one point, years ago, I suggested fibreglass gauze heat pressed into the film. Do we need that? Just for tensile strength? I haven't found a discussion of resins, glues and elastomers, so I'm raising theme here. There is a thermosetting resin that we might make on Mars- Urea/ Formaldehyde. Urea can be supplied (albeit not very intensively) by crews and livestock, and Formaldehyde can be made from synthesis gas using the right catalyst and conditions in the reformer. You wouldn't get much of it, though. This is a highly effective wood (or bamboo) glue but doesn't get used for fibre reinforced products. We need a resin that we can make on Mars to combine with the mineral fibres (aka rockwool) that we will be able to prepare from Martian sand and dust. Perhaps we might also be able to make silicone from Mars stuff, to seal our habs/ greenhouses with. This looks to me like an angels-on-the-head-of-a-pin argument. It's something that gets settled later, after people are already living there. With real, on-site data. As soon as you start to assemble structures that must retain pressure, you will need sealants. As it stands these must all be imported from Earth. Use of Martian fibres for FRP structures, giving early colonists the flexibility to build tailor made structural elements, will require a large inventory of resins. These must also be imported if we can't identify a way to make them locally. The problem is exacerbated by the tendency of these materials to deteriorate in storage. By the time they get to Mars, half their shelf life is gone. Of course oil itself won't do much good, but perhaps some type of sealant can be developed from this stuff. I am sure it will not be good for everything desired, but perhaps for some things. I would think that silicone caulks would be preferred, but perhaps harder to attain at least at first. This would be one application where using chemosynthesis could yield organic matter which could be cooked into oil/tars, etc, for various uses. It is already speculated that life on Mars could have and could now subsist on the O2 and CO in the Martian atmosphere as an energy source. A speculated method to obtain organic matter to turn into oil would be to compress Martian atmosphere into a water containment with other nutrients, and hope to have a micro-organism which would digest the O2 and CO. The product produced hopefully including organic matter to convert into oil/tar. The same process might also assist in yielding a purified stream of Nitrogen gasses. Also, as there is extra Oxygen apparently in the atmosphere relative to CO, and because I am hearing that greenhouses may generate extra Oxygen, it would be helpful if Mars did have Methane stored in its subsurface because then that could be added, to allow the organisms to consume all the Oxygen. The description of method is general, and not proven. It is too early to be specific because we don't have sufficient "Ground Truth" about Mars. I'm not a chemist but this suggests resins are mostly about carbon, oxygen and hydrogen...all of which are available on Mars - so what's the problem? I do suspect that human waste and other compostables will be needed for soil preparation if people are to grow crops on Mars. Nitrogen, sulphur and silicon need to be added to your list, Louis, all available on Mars. The plant to make most sealants and resin materials is quite complex, however. Polybutadiene might be fairly simple, in terms of ingredients, but making and purifying the monomer might not be so simple.